Firstly, I got very little knitting done the last week so it doesn't merit a photo! I've been really concentrating on other projects. It's been rainy and chilly all week, sigh, so knitting on the porch didn't happen too often! After my cheese making extravaganza last Tuesday, I decided to get out of the kitchen and do some painting. I sketched Marlene with the watercolour pencils. Then I just added water with a brush and you can see how they really resemble good old watercolour painting. 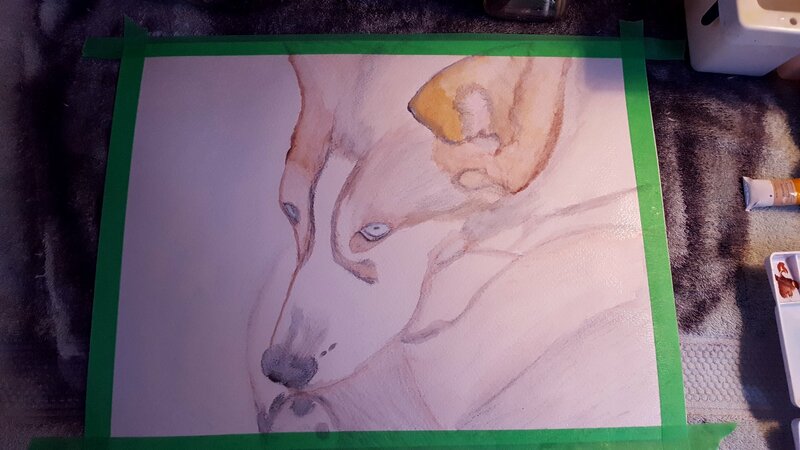 All of those colours are the pencils, except I had already started to add paint to her ear before I remembered to take a picture. The set I got was just 12 basic colours, but I may ask Alex for a nice big set for Christmas or my birthday with many more colours. I added a little more colour with my paints because the pencils alone weren't bright enough. I liked that I could go back to the painting after it dried so that I could pencil in some of her fur, so I guess it made it a mixed-media project! I will definitely continue to use the pencils because they allow me to see all the colours I want to paint and I don't have to wing it too much. I have a habit of seeing greens and yellows blend together beautifully and they ALWAYS turn into a poopy-brown mess lol! 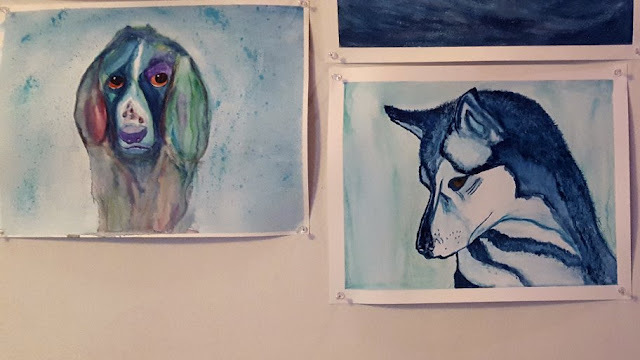 I'm not great at portraits, but I really wanted to paint our pets. I've already done Jack and Charlie. Booo! My fourth attempt to make a nice melty Pizza Mozzarella failed again...but it made a nice Ricotta. Dang. 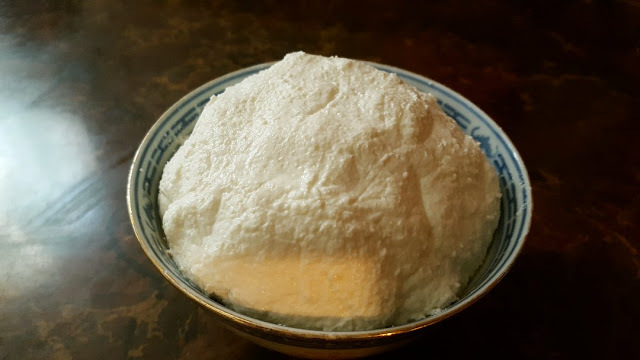 I wrote a more detailed post on Mozzarella on Rainy Day Cheese Making. I think what I'm missing for success is a PH meter to check acidity levels as I make this terribly finicky cheese. Anyway...failures teach you, and I have much more knowledge now than I did a week ago! 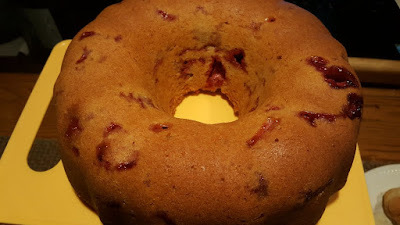 I made another Bundt cake yesterday using some strawberries I bought at the local market. I'm into Bundt cakes these days, they're so fun to create! My attempt to empty the deep freezer continues! 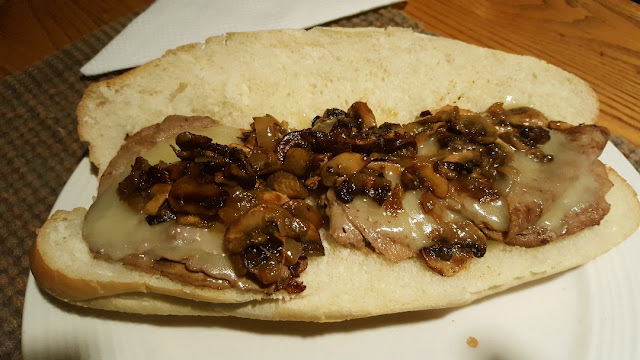 I found some fondue meat and chicken in the depths of the freezer, so I made Philly Cheese Steaks for dinner last night (you just fry up some onions and mushrooms, brown your meat or chicken and melt some cheese on top - delicious and easy!) My hopes were not to have to go grocery shopping until September, but we do need some supplies after all. It's been nearly a month since the last shopping day and I can't complain! So I've spent time going through the freezer again and planning menus and hopefully I can have the shopping list ready for Tuesday! Here is my 30-day dinner plan for anyone who wants some ideas. The plan started yesterday and I repeated some things from last month that we didn't get a chance to eat yet. Don't miss the Total Solar Eclipse tomorrow. Depending on where you live, you might enjoy a total or a partial eclipse! We're hoping for clear skies so we can enjoy it - safely! I have to remind myself to eat before I read your blog - now I want cheese, and cake and everything! Yes we are waiting for the eclipse tomorrow. We had hoped to get to the path of totality - but life got in the way - we will see about 88% here in our neck of the woods. You paintings are amazing - I love Madeline's blue eyes. 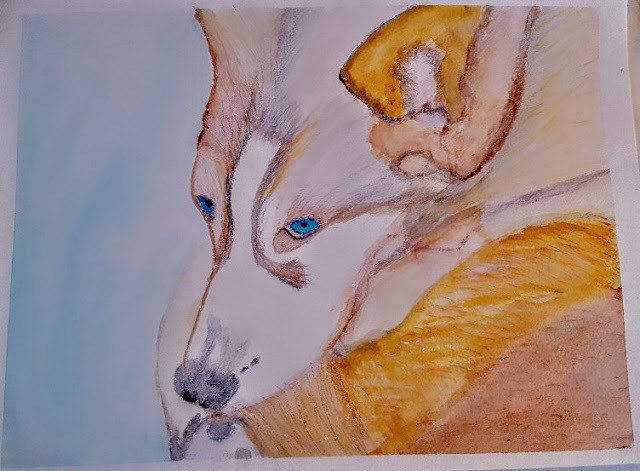 Lol Mary-Anne, I'm glad my photos get your appetite going :) And thank you, I love the painting but I noticed with the watercolour pencils that the colours aren't as bright as the other painting...mind you, it could be the colours I chose too. Hi Rain. The paintings are very good. Like anything you do you have put a lot of effort into it and it shows. So no complaints there. I'll just check out your other sites now, but keep on doing whatever you're doing because it's working! Rain - i looove all of your paintings but that seahorse is to die for! i know that you painted it for alex so i won't ask if you will send it to me for xmas - bahahahah! the cake looks delicious but that sandwich - OH MY!!!! i am very glad to hear you keeping yourself busy and glad that you are liking the pencils - they seem to be working out well for you! i love the colours that you choose so just keep going on instinct. i told you before girl - start selling your paintings! people will love to have a "Rain Original"!!! sending love to you and alex and i can't even remember how many dogs and cats you have - but sending love to all of them also! thank you for all of your sweet comments on our blog! i noticed you made poutine the other day - it looked delicious! we are making "vladimir poutine" (putin) tomorrow...we don't care much for politics, like you, but we love to make up our own special words. poutine has been "vladimir poutine" for years now. probably no one else will get how funny that is! I haven't used water color pencils but they look like they work well. I used Chinese brushes, the round ones that are used for writing. I like the way they moved the paint, really good for foliage. I like to use gouache as it has white and sometimes I can't plan far enough ahead to use the white of the paper. Every time I visit your blog, I'm (suspiciously) hungry :) You have reminded me to make those philly sandwiches! I've got some leftover chicken in the freezer that would be perfect for them. Your paintings are wonderful! What a great way to relax and be creative. Coincidentally, I spent a good amount of time on YouTube today watching videos of painting. I started off with paint-by-number clips and branched out to more independent styles of painting. It looks like fun and I may try some out. I'll definitely tackle a couple of paint by number kits just to have fun and then venture off into more interesting areas. What an interesting group of people on YoP this year. I love your paintings. The cheese making looks fascinating too. Look forward to seeing your cat paintings. Look at your painting! You just get better and better and at cheese making too! I have to go back and catch up as I was not on my pc much this week. I love the painting of Marlene....I like the effect of the watercolor pencils and your multi-media approach. Your artwork looks great. The food too. We have cut back on alcohol and cheeses. Alcohol lowers the immune system, and cheese is expensive to buy organic. I don't have raw milk (yet), but hopefully soon. Today, it's back in the kitchen for me. Preparing for winter. hey rain! i couldn't find your email but check out about using your camera during the eclipse. i saw somewhere that it can burn out the lens or something along those lines! Wonderful work and very creative indeed, well done to you. Warm greetings. 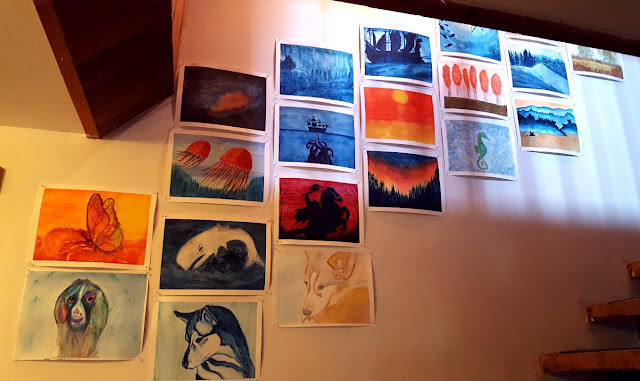 I love your wall of watercolors! I'm not sure how you find time to do all this - have you discovered the art of cloning, along with your other talents? Stick with the mozz - you'll get it! Hi Gill :) I like using the fan brushes for foliage, but mine are so used up that I should probably get new ones. I used them a lot in my oil painting and it kind of destroyed them over the years. I actually use a Chinese brush for most of the watercolour too! It's a biggish size one and I love how it holds the colours. Hi RO :) Oh thank you :) I have issues with my hands too but I use a natural remedy called Arnica gel and it works wonders. I have early signs of arthritis unfortunately. But the gel helps with the pain and I can enjoy knitting, at least for now! Hi Martha :) You're so sweet :)) Alex and I are really a good couple, we have lots in common. It's comfy :) I hope you find some good paint by numbers at Michaels. You could also try Amazon, they have lots of stuff on there that might be good if you don't have to pay for shipping. I really started painting many years ago, but I only started to seriously paint in 2013. Before that I started out by tracing everything and copying colours from other paintings I saw. I still use other paintings as my inspiration but I'm finding I can be more independent now with my own ideas, which I like. But it took me a lot of time. I think that being original is great, but there's nothing wrong with copying too or paint by number is you really enjoy what you're doing! I can't wait to hear about your painting! 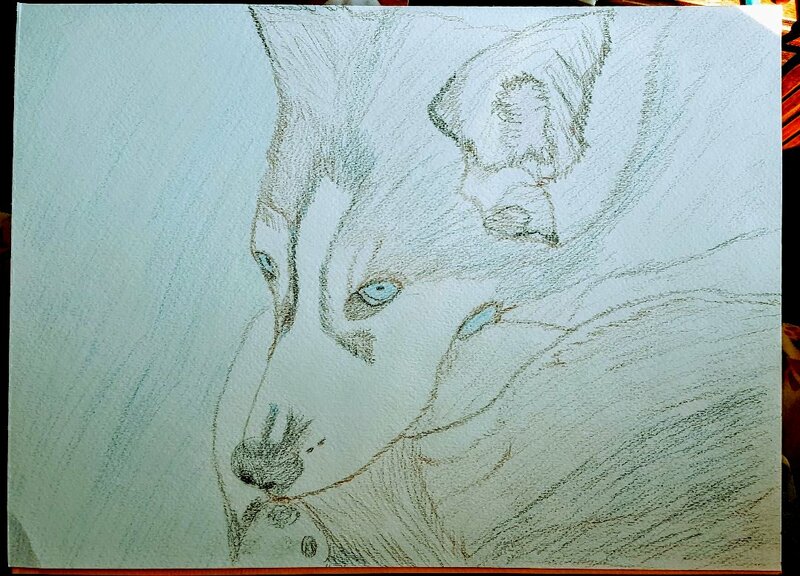 Hi Sam :) Thanks :) And thank YOU for the pencil idea! They really help visually. Sometimes when I was sketching something, I had a tough time trying to visualize the colours and I'd have to start paintings over and over again, the pencils make it so much easier for me to get the colours I want. And you can erase them too, which is nice if you want to change things! Hi Kristina :) Organic cheese is really expensive here too. But luckily we have a good cheese shop that has lots of imported cheeses and they don't have crazy ingredients in them to louse up our digestions. It's just the grocery store ones that we can't handle anymore. I hope you take it easy in the kitchen!! Hi Joyce :) Thanks again for the tip! I'm out on the porch as I type this and it's so cloudy out...hard to tell what's going on! Hi Blogoratti :) Thank you! :) If I can't be creative, I feel kind of down in the dumps, so I try to do something every day like this. Hi Susan :) Thanks, I'll keep trying the Mozzarella until I get it right! I really want to able to say I DID IT. Lol at the cloning! The watercolour wall gives us a lot of joy whenever we go up and down the stairs, it's so nice and colourful! I want to add more to it soon! I love making bundt cakes! I made mini and regular sized cupcakes on the weekend as we had company both Saturday and Sunday so that worked out well. But I am now on vacation and don't feel like cooking one bit! :) But I will. Last night I made chicken tikka masala and jeera rice. I LOVE jeera rice! Enjoy your vacation! Your dinner sounds good, I had to look those up! :) We're not much into curry here, we're not too fond of it, but I always loved the smell of it! I admire you for having so much energy and the great projects you work on. did you painted this Rain! i am AMAZED as you sounds to have bundles of talents. Awesome painting truly beautiful . i am glad that kitchen break explored your artistic side to us . outstanding beauty you created here . Your watercolor wall is beautiful! What a simple, but wonderful way to have collected your lovely paintings together. You inspire me in so many ways, Rain. Your watercolour wall is amazing!! I love it. I really like how those water colour pencils look. Awesome job friend!! Marlene looks lovely and I can't wait to see the kitties. Hi Becki :) Thank you !! It feels good to hear that you inspire people. I had the watercolours all tucked away for a long time, hoping to frame them. But framing that many paintings would have been really expensive so I figured why hide them? As long as the cats don't get too curious about the push pins, we're doing okay lol! Hi Jenn :) Thank you! The pencils really surprised me! I don't know that I'd "paint" only with them because I love the vibrant colours of the paint, but they are definitely fun! Hi Sis :)) Me too, I didn't see the eclipse because it clouded over. Oh well, we have another chance in what, 20 years? Something like that! It was definitely a magical afternoon though. I'm not giving up on that Mozza, but my gosh, a fifth try will definitely be a LAST try!! I'll move on to other cheeses if the next one (with PH Meter) doesn't work! 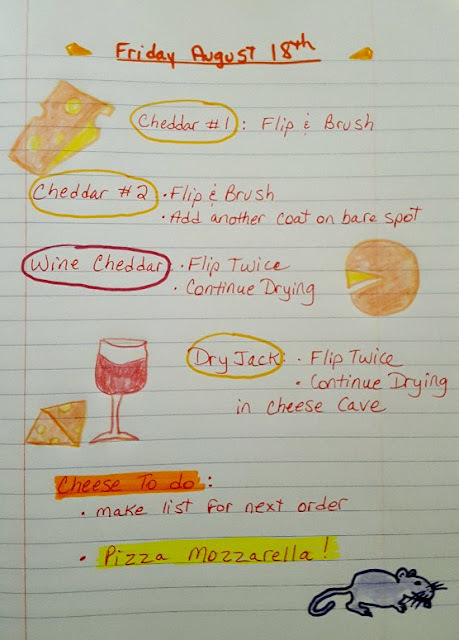 I used to have a lot of trouble with mozzarella too, until someone stepped up with some tips that have really helped me be successful. It's for raw goat milk, which I don't think you use (???) but here's the link to what I learned, "Mozzarella Making Revisited". Great goal to paint all your pets! It's fun to see them. I sent you the info but last night got an alert saying it was orbiting your addy but couldn't deliver the email. It will try for another 45 hrs. walnettofarm@gmail.com and I will try sendiyit in a reply to you. 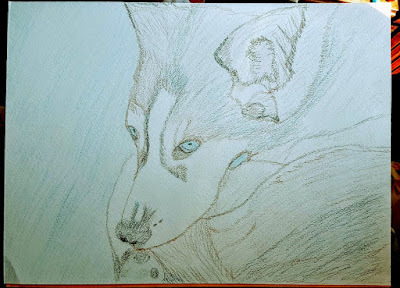 My sons does pencil sketchings, I guess that is what you call it. He has tried water colors but found it a difficult medium to master. Art is one of his favorite hobbies, which is good because he works hard and his job is stressful. I like your work very much. Have you ever thought about doing ferrets? They make good subjects, even if you are working from a picture. Hi Leigh :) Thank you for the link!! Your Mozza looks so amazing...not just on the pizza, but that twisty stetchy little nugget that I just can't seem to accomplish! No, I don't use goat's milk, I don't have access to anything but grocery store homogenized/pasteurized milk. I've been getting lots of tips though and I have them all written down. I'm on my last attempt as I type this, the curd is cooking. If this doesn't work, I might blame it on either the culture or the milk. But my hard/aging cheeses seem to be doing well so I might forfeit the Mozza making until I have access to REAL milk!! 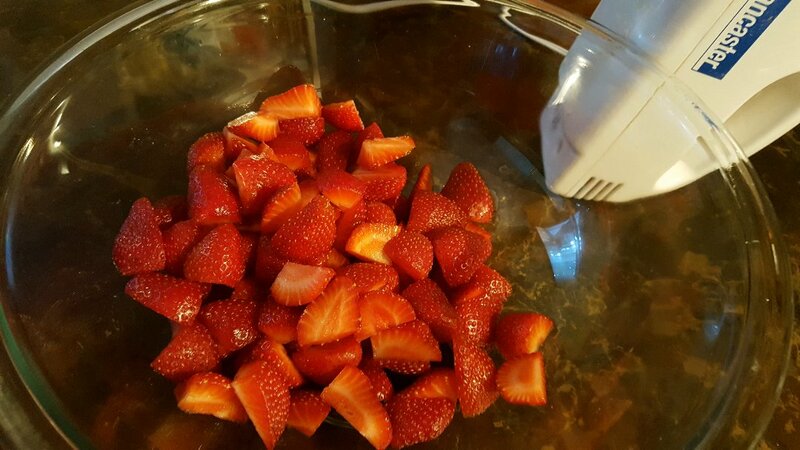 Hi RO :) The strawberries are so sweet this time of year! I wish we could get them year round. Well, we can but they aren't very good. We're eating lots of them right now! Thanks Goatldi :)) Well, we shall see...I'm so happy you sent me that recipe, though I don't have access to goat milk. But one day I'll have Ricki's book too and see what other treasures she has! And hopefully I'll have goats to help me along too! :)) The unfortunate part of using grocery store milk is that the pasteurization process kills a lot of the calcium molecules needed to make a good curd...so that's why all the recipes say to use Calcium Chloride...which is so contrary because all advice says to NEVER use it for Mozzas and Provolones because it kills the stretch. It's frustrating! Hi Harry :) Nice to see your comment! I hope you get your blog back up. I've been getting spam too, but I just mark them as spam and delete them. I don't get too much so it hasn't reached the point of annoying yet! I found watercolour difficult too, but only because I was trying to paint with watercolours...does that make sense? When I decided to just paint the way I normally did with acrylics, it worked out better for me. I think it's great that your son paints, it really does relax a person! I never thought of ferrets! But I do love wildlife, so I'm going to look for some inspiration!